In the RefitLLVM solution folder, delete all bin folders and obj folders. I recommend using this tool to clean the bin & obj folders. 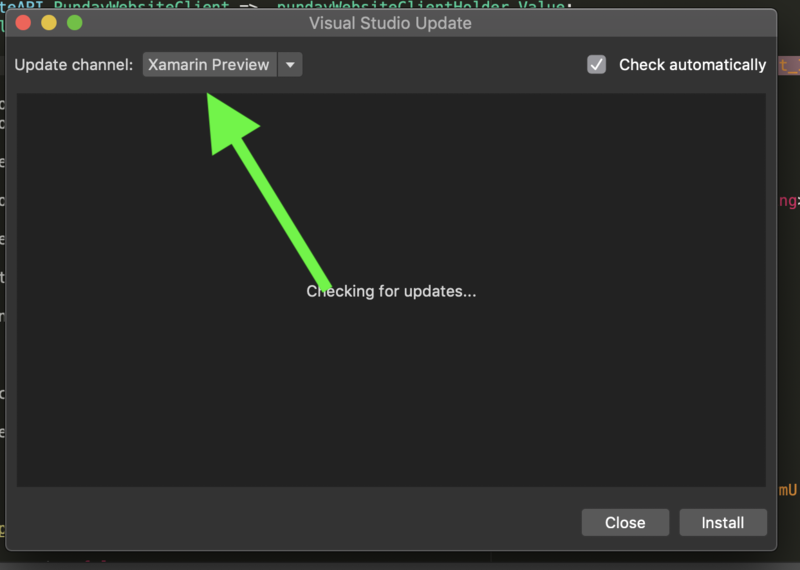 Open the current Xamarin Preview channel of Visual Studio for Mac 2019 Preview as of 21 March 2019 @ 1530 UTC. Popup in the reproduction sample should display Success! Popup in the reproduction sample should display Failed, indicating that LLVM has over-optimized the code. Build started 3/21/2019 8:45:23 AM. Skipping target "XamlG" because it has no outputs. Skipping target "CssG" because it has no outputs. Creating "obj/iPhone/Release/netstandard2.0/XamlC.stamp" because "AlwaysCreate" was specified. Copying file from "/Users/bramin/Projects/GitHub/URLEncodedFormBug_LLVM/RefitLLVMRepro/RefitLLVMRepro/obj/iPhone/Release/netstandard2.0/RefitLLVMRepro.dll" to "/Users/bramin/Projects/GitHub/URLEncodedFormBug_LLVM/RefitLLVMRepro/RefitLLVMRepro/bin/iPhone/Release/netstandard2.0/RefitLLVMRepro.dll". Directory "obj/iPhone/ReleaseLLVM/actool" doesn't exist. Skipping. Skipping target "_CoreCompileColladaAssets" because it has no inputs. Skipping target "_BeforeCoreCompileSceneKitAssets" because it has no inputs. Skipping target "_CoreCompileSceneKitAssets" because it has no inputs. Skipping target "_BeforeCompileTextureAtlases" because it has no inputs. Skipping target "_CoreCompileTextureAtlases" because it has no inputs. Directory "obj/iPhone/ReleaseLLVM/coremlc" doesn't exist. Skipping. Skipping target "_CoreOptimizePngImages" because it has no outputs. Skipping target "_CoreOptimizePropertyLists" because it has no inputs. Skipping target "_CoreOptimizeLocalizationFiles" because it has no inputs. Creating "obj/iPhone/ReleaseLLVM/XamlC.stamp" because "AlwaysCreate" was specified. Copying file from "/Users/bramin/.nuget/packages/asyncawaitbestpractices/2.1.0/lib/netstandard/AsyncAwaitBestPractices.dll" to "/Users/bramin/Projects/GitHub/URLEncodedFormBug_LLVM/RefitLLVMRepro/RefitLLVMRepro.iOS/bin/iPhone/ReleaseLLVM/AsyncAwaitBestPractices.dll". Copying file from "/Users/bramin/.nuget/packages/asyncawaitbestpractices/2.1.0/lib/netstandard/AsyncAwaitBestPractices.pdb" to "/Users/bramin/Projects/GitHub/URLEncodedFormBug_LLVM/RefitLLVMRepro/RefitLLVMRepro.iOS/bin/iPhone/ReleaseLLVM/AsyncAwaitBestPractices.pdb". Copying file from "/Users/bramin/.nuget/packages/asyncawaitbestpractices.mvvm/2.1.0/lib/netstandard/AsyncAwaitBestPractices.MVVM.dll" to "/Users/bramin/Projects/GitHub/URLEncodedFormBug_LLVM/RefitLLVMRepro/RefitLLVMRepro.iOS/bin/iPhone/ReleaseLLVM/AsyncAwaitBestPractices.MVVM.dll". Copying file from "/Users/bramin/.nuget/packages/newtonsoft.json/12.0.1/lib/netstandard2.0/Newtonsoft.Json.dll" to "/Users/bramin/Projects/GitHub/URLEncodedFormBug_LLVM/RefitLLVMRepro/RefitLLVMRepro.iOS/bin/iPhone/ReleaseLLVM/Newtonsoft.Json.dll". Copying file from "/Users/bramin/.nuget/packages/newtonsoft.json/12.0.1/lib/netstandard2.0/Newtonsoft.Json.pdb" to "/Users/bramin/Projects/GitHub/URLEncodedFormBug_LLVM/RefitLLVMRepro/RefitLLVMRepro.iOS/bin/iPhone/ReleaseLLVM/Newtonsoft.Json.pdb". Copying file from "/Users/bramin/.nuget/packages/asyncawaitbestpractices.mvvm/2.1.0/lib/netstandard/AsyncAwaitBestPractices.MVVM.pdb" to "/Users/bramin/Projects/GitHub/URLEncodedFormBug_LLVM/RefitLLVMRepro/RefitLLVMRepro.iOS/bin/iPhone/ReleaseLLVM/AsyncAwaitBestPractices.MVVM.pdb". Copying file from "/Users/bramin/.nuget/packages/xamarin.essentials/1.1.0/lib/xamarinios10/Xamarin.Essentials.pdb" to "/Users/bramin/Projects/GitHub/URLEncodedFormBug_LLVM/RefitLLVMRepro/RefitLLVMRepro.iOS/bin/iPhone/ReleaseLLVM/Xamarin.Essentials.pdb". Copying file from "/Users/bramin/.nuget/packages/xamarin.forms/3.6.0.264807/lib/Xamarin.iOS10/Xamarin.Forms.Core.dll" to "/Users/bramin/Projects/GitHub/URLEncodedFormBug_LLVM/RefitLLVMRepro/RefitLLVMRepro.iOS/bin/iPhone/ReleaseLLVM/Xamarin.Forms.Core.dll". Copying file from "/Users/bramin/.nuget/packages/xamarin.forms/3.6.0.264807/lib/Xamarin.iOS10/Xamarin.Forms.Core.pdb" to "/Users/bramin/Projects/GitHub/URLEncodedFormBug_LLVM/RefitLLVMRepro/RefitLLVMRepro.iOS/bin/iPhone/ReleaseLLVM/Xamarin.Forms.Core.pdb". Copying file from "/Users/bramin/.nuget/packages/xamarin.essentials/1.1.0/lib/xamarinios10/Xamarin.Essentials.dll" to "/Users/bramin/Projects/GitHub/URLEncodedFormBug_LLVM/RefitLLVMRepro/RefitLLVMRepro.iOS/bin/iPhone/ReleaseLLVM/Xamarin.Essentials.dll". Copying file from "/Users/bramin/.nuget/packages/refit/4.6.99/lib/netstandard2.0/Refit.dll" to "/Users/bramin/Projects/GitHub/URLEncodedFormBug_LLVM/RefitLLVMRepro/RefitLLVMRepro.iOS/bin/iPhone/ReleaseLLVM/Refit.dll". Copying file from "/Users/bramin/.nuget/packages/xamarin.forms/3.6.0.264807/lib/Xamarin.iOS10/Xamarin.Forms.Platform.dll" to "/Users/bramin/Projects/GitHub/URLEncodedFormBug_LLVM/RefitLLVMRepro/RefitLLVMRepro.iOS/bin/iPhone/ReleaseLLVM/Xamarin.Forms.Platform.dll". Copying file from "/Users/bramin/.nuget/packages/xamarin.forms/3.6.0.264807/lib/Xamarin.iOS10/Xamarin.Forms.Platform.iOS.dll" to "/Users/bramin/Projects/GitHub/URLEncodedFormBug_LLVM/RefitLLVMRepro/RefitLLVMRepro.iOS/bin/iPhone/ReleaseLLVM/Xamarin.Forms.Platform.iOS.dll". Copying file from "/Users/bramin/.nuget/packages/xamarin.forms/3.6.0.264807/lib/Xamarin.iOS10/Xamarin.Forms.Platform.iOS.pdb" to "/Users/bramin/Projects/GitHub/URLEncodedFormBug_LLVM/RefitLLVMRepro/RefitLLVMRepro.iOS/bin/iPhone/ReleaseLLVM/Xamarin.Forms.Platform.iOS.pdb". Copying file from "/Users/bramin/.nuget/packages/xamarin.forms/3.6.0.264807/lib/Xamarin.iOS10/Xamarin.Forms.Xaml.dll" to "/Users/bramin/Projects/GitHub/URLEncodedFormBug_LLVM/RefitLLVMRepro/RefitLLVMRepro.iOS/bin/iPhone/ReleaseLLVM/Xamarin.Forms.Xaml.dll". Copying file from "/Users/bramin/.nuget/packages/xamarin.forms/3.6.0.264807/lib/Xamarin.iOS10/Xamarin.Forms.Xaml.pdb" to "/Users/bramin/Projects/GitHub/URLEncodedFormBug_LLVM/RefitLLVMRepro/RefitLLVMRepro.iOS/bin/iPhone/ReleaseLLVM/Xamarin.Forms.Xaml.pdb". Copying file from "/Users/bramin/.nuget/packages/xamarin.forms/3.6.0.264807/lib/Xamarin.iOS10/ar/Xamarin.Forms.Platform.iOS.resources.dll" to "/Users/bramin/Projects/GitHub/URLEncodedFormBug_LLVM/RefitLLVMRepro/RefitLLVMRepro.iOS/bin/iPhone/ReleaseLLVM/ar/Xamarin.Forms.Platform.iOS.resources.dll". Copying file from "/Users/bramin/.nuget/packages/xamarin.forms/3.6.0.264807/lib/Xamarin.iOS10/cs/Xamarin.Forms.Platform.iOS.resources.dll" to "/Users/bramin/Projects/GitHub/URLEncodedFormBug_LLVM/RefitLLVMRepro/RefitLLVMRepro.iOS/bin/iPhone/ReleaseLLVM/cs/Xamarin.Forms.Platform.iOS.resources.dll". Copying file from "/Users/bramin/.nuget/packages/xamarin.forms/3.6.0.264807/lib/Xamarin.iOS10/ca/Xamarin.Forms.Platform.iOS.resources.dll" to "/Users/bramin/Projects/GitHub/URLEncodedFormBug_LLVM/RefitLLVMRepro/RefitLLVMRepro.iOS/bin/iPhone/ReleaseLLVM/ca/Xamarin.Forms.Platform.iOS.resources.dll". Copying file from "/Users/bramin/.nuget/packages/xamarin.forms/3.6.0.264807/lib/Xamarin.iOS10/da/Xamarin.Forms.Platform.iOS.resources.dll" to "/Users/bramin/Projects/GitHub/URLEncodedFormBug_LLVM/RefitLLVMRepro/RefitLLVMRepro.iOS/bin/iPhone/ReleaseLLVM/da/Xamarin.Forms.Platform.iOS.resources.dll". Copying file from "/Users/bramin/.nuget/packages/xamarin.forms/3.6.0.264807/lib/Xamarin.iOS10/de/Xamarin.Forms.Platform.iOS.resources.dll" to "/Users/bramin/Projects/GitHub/URLEncodedFormBug_LLVM/RefitLLVMRepro/RefitLLVMRepro.iOS/bin/iPhone/ReleaseLLVM/de/Xamarin.Forms.Platform.iOS.resources.dll". Copying file from "/Users/bramin/.nuget/packages/xamarin.forms/3.6.0.264807/lib/Xamarin.iOS10/es/Xamarin.Forms.Platform.iOS.resources.dll" to "/Users/bramin/Projects/GitHub/URLEncodedFormBug_LLVM/RefitLLVMRepro/RefitLLVMRepro.iOS/bin/iPhone/ReleaseLLVM/es/Xamarin.Forms.Platform.iOS.resources.dll". Copying file from "/Users/bramin/.nuget/packages/xamarin.forms/3.6.0.264807/lib/Xamarin.iOS10/el/Xamarin.Forms.Platform.iOS.resources.dll" to "/Users/bramin/Projects/GitHub/URLEncodedFormBug_LLVM/RefitLLVMRepro/RefitLLVMRepro.iOS/bin/iPhone/ReleaseLLVM/el/Xamarin.Forms.Platform.iOS.resources.dll". Copying file from "/Users/bramin/.nuget/packages/xamarin.forms/3.6.0.264807/lib/Xamarin.iOS10/fr/Xamarin.Forms.Platform.iOS.resources.dll" to "/Users/bramin/Projects/GitHub/URLEncodedFormBug_LLVM/RefitLLVMRepro/RefitLLVMRepro.iOS/bin/iPhone/ReleaseLLVM/fr/Xamarin.Forms.Platform.iOS.resources.dll". Copying file from "/Users/bramin/.nuget/packages/xamarin.forms/3.6.0.264807/lib/Xamarin.iOS10/he/Xamarin.Forms.Platform.iOS.resources.dll" to "/Users/bramin/Projects/GitHub/URLEncodedFormBug_LLVM/RefitLLVMRepro/RefitLLVMRepro.iOS/bin/iPhone/ReleaseLLVM/he/Xamarin.Forms.Platform.iOS.resources.dll". Copying file from "/Users/bramin/.nuget/packages/xamarin.forms/3.6.0.264807/lib/Xamarin.iOS10/fi/Xamarin.Forms.Platform.iOS.resources.dll" to "/Users/bramin/Projects/GitHub/URLEncodedFormBug_LLVM/RefitLLVMRepro/RefitLLVMRepro.iOS/bin/iPhone/ReleaseLLVM/fi/Xamarin.Forms.Platform.iOS.resources.dll". Copying file from "/Users/bramin/.nuget/packages/xamarin.forms/3.6.0.264807/lib/Xamarin.iOS10/hi/Xamarin.Forms.Platform.iOS.resources.dll" to "/Users/bramin/Projects/GitHub/URLEncodedFormBug_LLVM/RefitLLVMRepro/RefitLLVMRepro.iOS/bin/iPhone/ReleaseLLVM/hi/Xamarin.Forms.Platform.iOS.resources.dll". Copying file from "/Users/bramin/.nuget/packages/xamarin.forms/3.6.0.264807/lib/Xamarin.iOS10/hr/Xamarin.Forms.Platform.iOS.resources.dll" to "/Users/bramin/Projects/GitHub/URLEncodedFormBug_LLVM/RefitLLVMRepro/RefitLLVMRepro.iOS/bin/iPhone/ReleaseLLVM/hr/Xamarin.Forms.Platform.iOS.resources.dll". Copying file from "/Users/bramin/.nuget/packages/xamarin.forms/3.6.0.264807/lib/Xamarin.iOS10/hu/Xamarin.Forms.Platform.iOS.resources.dll" to "/Users/bramin/Projects/GitHub/URLEncodedFormBug_LLVM/RefitLLVMRepro/RefitLLVMRepro.iOS/bin/iPhone/ReleaseLLVM/hu/Xamarin.Forms.Platform.iOS.resources.dll". Copying file from "/Users/bramin/.nuget/packages/xamarin.forms/3.6.0.264807/lib/Xamarin.iOS10/id/Xamarin.Forms.Platform.iOS.resources.dll" to "/Users/bramin/Projects/GitHub/URLEncodedFormBug_LLVM/RefitLLVMRepro/RefitLLVMRepro.iOS/bin/iPhone/ReleaseLLVM/id/Xamarin.Forms.Platform.iOS.resources.dll". Copying file from "/Users/bramin/.nuget/packages/xamarin.forms/3.6.0.264807/lib/Xamarin.iOS10/it/Xamarin.Forms.Platform.iOS.resources.dll" to "/Users/bramin/Projects/GitHub/URLEncodedFormBug_LLVM/RefitLLVMRepro/RefitLLVMRepro.iOS/bin/iPhone/ReleaseLLVM/it/Xamarin.Forms.Platform.iOS.resources.dll". Copying file from "/Users/bramin/.nuget/packages/xamarin.forms/3.6.0.264807/lib/Xamarin.iOS10/ja/Xamarin.Forms.Platform.iOS.resources.dll" to "/Users/bramin/Projects/GitHub/URLEncodedFormBug_LLVM/RefitLLVMRepro/RefitLLVMRepro.iOS/bin/iPhone/ReleaseLLVM/ja/Xamarin.Forms.Platform.iOS.resources.dll". Copying file from "/Users/bramin/.nuget/packages/xamarin.forms/3.6.0.264807/lib/Xamarin.iOS10/ms/Xamarin.Forms.Platform.iOS.resources.dll" to "/Users/bramin/Projects/GitHub/URLEncodedFormBug_LLVM/RefitLLVMRepro/RefitLLVMRepro.iOS/bin/iPhone/ReleaseLLVM/ms/Xamarin.Forms.Platform.iOS.resources.dll". Copying file from "/Users/bramin/.nuget/packages/xamarin.forms/3.6.0.264807/lib/Xamarin.iOS10/ko/Xamarin.Forms.Platform.iOS.resources.dll" to "/Users/bramin/Projects/GitHub/URLEncodedFormBug_LLVM/RefitLLVMRepro/RefitLLVMRepro.iOS/bin/iPhone/ReleaseLLVM/ko/Xamarin.Forms.Platform.iOS.resources.dll". Copying file from "/Users/bramin/.nuget/packages/xamarin.forms/3.6.0.264807/lib/Xamarin.iOS10/nl/Xamarin.Forms.Platform.iOS.resources.dll" to "/Users/bramin/Projects/GitHub/URLEncodedFormBug_LLVM/RefitLLVMRepro/RefitLLVMRepro.iOS/bin/iPhone/ReleaseLLVM/nl/Xamarin.Forms.Platform.iOS.resources.dll". Copying file from "/Users/bramin/.nuget/packages/xamarin.forms/3.6.0.264807/lib/Xamarin.iOS10/nb/Xamarin.Forms.Platform.iOS.resources.dll" to "/Users/bramin/Projects/GitHub/URLEncodedFormBug_LLVM/RefitLLVMRepro/RefitLLVMRepro.iOS/bin/iPhone/ReleaseLLVM/nb/Xamarin.Forms.Platform.iOS.resources.dll". Copying file from "/Users/bramin/.nuget/packages/xamarin.forms/3.6.0.264807/lib/Xamarin.iOS10/pt-BR/Xamarin.Forms.Platform.iOS.resources.dll" to "/Users/bramin/Projects/GitHub/URLEncodedFormBug_LLVM/RefitLLVMRepro/RefitLLVMRepro.iOS/bin/iPhone/ReleaseLLVM/pt-BR/Xamarin.Forms.Platform.iOS.resources.dll". Copying file from "/Users/bramin/.nuget/packages/xamarin.forms/3.6.0.264807/lib/Xamarin.iOS10/pl/Xamarin.Forms.Platform.iOS.resources.dll" to "/Users/bramin/Projects/GitHub/URLEncodedFormBug_LLVM/RefitLLVMRepro/RefitLLVMRepro.iOS/bin/iPhone/ReleaseLLVM/pl/Xamarin.Forms.Platform.iOS.resources.dll". Copying file from "/Users/bramin/.nuget/packages/xamarin.forms/3.6.0.264807/lib/Xamarin.iOS10/pt/Xamarin.Forms.Platform.iOS.resources.dll" to "/Users/bramin/Projects/GitHub/URLEncodedFormBug_LLVM/RefitLLVMRepro/RefitLLVMRepro.iOS/bin/iPhone/ReleaseLLVM/pt/Xamarin.Forms.Platform.iOS.resources.dll". Copying file from "/Users/bramin/.nuget/packages/xamarin.forms/3.6.0.264807/lib/Xamarin.iOS10/sk/Xamarin.Forms.Platform.iOS.resources.dll" to "/Users/bramin/Projects/GitHub/URLEncodedFormBug_LLVM/RefitLLVMRepro/RefitLLVMRepro.iOS/bin/iPhone/ReleaseLLVM/sk/Xamarin.Forms.Platform.iOS.resources.dll". Copying file from "/Users/bramin/.nuget/packages/xamarin.forms/3.6.0.264807/lib/Xamarin.iOS10/ru/Xamarin.Forms.Platform.iOS.resources.dll" to "/Users/bramin/Projects/GitHub/URLEncodedFormBug_LLVM/RefitLLVMRepro/RefitLLVMRepro.iOS/bin/iPhone/ReleaseLLVM/ru/Xamarin.Forms.Platform.iOS.resources.dll". Copying file from "/Users/bramin/.nuget/packages/xamarin.forms/3.6.0.264807/lib/Xamarin.iOS10/ro/Xamarin.Forms.Platform.iOS.resources.dll" to "/Users/bramin/Projects/GitHub/URLEncodedFormBug_LLVM/RefitLLVMRepro/RefitLLVMRepro.iOS/bin/iPhone/ReleaseLLVM/ro/Xamarin.Forms.Platform.iOS.resources.dll". Copying file from "/Users/bramin/.nuget/packages/xamarin.forms/3.6.0.264807/lib/Xamarin.iOS10/sv/Xamarin.Forms.Platform.iOS.resources.dll" to "/Users/bramin/Projects/GitHub/URLEncodedFormBug_LLVM/RefitLLVMRepro/RefitLLVMRepro.iOS/bin/iPhone/ReleaseLLVM/sv/Xamarin.Forms.Platform.iOS.resources.dll". Copying file from "/Users/bramin/.nuget/packages/xamarin.forms/3.6.0.264807/lib/Xamarin.iOS10/tr/Xamarin.Forms.Platform.iOS.resources.dll" to "/Users/bramin/Projects/GitHub/URLEncodedFormBug_LLVM/RefitLLVMRepro/RefitLLVMRepro.iOS/bin/iPhone/ReleaseLLVM/tr/Xamarin.Forms.Platform.iOS.resources.dll". Copying file from "/Users/bramin/.nuget/packages/xamarin.forms/3.6.0.264807/lib/Xamarin.iOS10/th/Xamarin.Forms.Platform.iOS.resources.dll" to "/Users/bramin/Projects/GitHub/URLEncodedFormBug_LLVM/RefitLLVMRepro/RefitLLVMRepro.iOS/bin/iPhone/ReleaseLLVM/th/Xamarin.Forms.Platform.iOS.resources.dll". Copying file from "/Users/bramin/.nuget/packages/xamarin.forms/3.6.0.264807/lib/Xamarin.iOS10/zh-HK/Xamarin.Forms.Platform.iOS.resources.dll" to "/Users/bramin/Projects/GitHub/URLEncodedFormBug_LLVM/RefitLLVMRepro/RefitLLVMRepro.iOS/bin/iPhone/ReleaseLLVM/zh-HK/Xamarin.Forms.Platform.iOS.resources.dll". Copying file from "/Users/bramin/.nuget/packages/xamarin.forms/3.6.0.264807/lib/Xamarin.iOS10/uk/Xamarin.Forms.Platform.iOS.resources.dll" to "/Users/bramin/Projects/GitHub/URLEncodedFormBug_LLVM/RefitLLVMRepro/RefitLLVMRepro.iOS/bin/iPhone/ReleaseLLVM/uk/Xamarin.Forms.Platform.iOS.resources.dll". Copying file from "/Users/bramin/Projects/GitHub/URLEncodedFormBug_LLVM/RefitLLVMRepro/RefitLLVMRepro/bin/iPhone/Release/netstandard2.0/RefitLLVMRepro.dll" to "/Users/bramin/Projects/GitHub/URLEncodedFormBug_LLVM/RefitLLVMRepro/RefitLLVMRepro.iOS/bin/iPhone/ReleaseLLVM/RefitLLVMRepro.dll". Copying file from "/Users/bramin/.nuget/packages/xamarin.forms/3.6.0.264807/lib/Xamarin.iOS10/zh-Hant/Xamarin.Forms.Platform.iOS.resources.dll" to "/Users/bramin/Projects/GitHub/URLEncodedFormBug_LLVM/RefitLLVMRepro/RefitLLVMRepro.iOS/bin/iPhone/ReleaseLLVM/zh-Hant/Xamarin.Forms.Platform.iOS.resources.dll". Copying file from "/Users/bramin/.nuget/packages/xamarin.forms/3.6.0.264807/lib/Xamarin.iOS10/vi/Xamarin.Forms.Platform.iOS.resources.dll" to "/Users/bramin/Projects/GitHub/URLEncodedFormBug_LLVM/RefitLLVMRepro/RefitLLVMRepro.iOS/bin/iPhone/ReleaseLLVM/vi/Xamarin.Forms.Platform.iOS.resources.dll". Copying file from "/Users/bramin/.nuget/packages/xamarin.forms/3.6.0.264807/lib/Xamarin.iOS10/zh-Hans/Xamarin.Forms.Platform.iOS.resources.dll" to "/Users/bramin/Projects/GitHub/URLEncodedFormBug_LLVM/RefitLLVMRepro/RefitLLVMRepro.iOS/bin/iPhone/ReleaseLLVM/zh-Hans/Xamarin.Forms.Platform.iOS.resources.dll". Creating "/Users/bramin/Projects/GitHub/URLEncodedFormBug_LLVM/RefitLLVMRepro/RefitLLVMRepro.iOS/obj/iPhone/ReleaseLLVM/RefitLLVMRepro.iOS.csproj.CopyComplete" because "AlwaysCreate" was specified. Copying file from "/Users/bramin/Projects/GitHub/URLEncodedFormBug_LLVM/RefitLLVMRepro/RefitLLVMRepro.iOS/obj/iPhone/ReleaseLLVM/RefitLLVMRepro.iOS.exe" to "/Users/bramin/Projects/GitHub/URLEncodedFormBug_LLVM/RefitLLVMRepro/RefitLLVMRepro.iOS/bin/iPhone/ReleaseLLVM/RefitLLVMRepro.iOS.exe". Multiple provisioning profiles match the bundle identifier; using the first match. Signing Identity: "iPhone Developer: Brandon Minnick (9KP9896HY2)"
Directory "bin/iPhone/ReleaseLLVM/RefitLLVMRepro.iOS.app.dSYM" doesn't exist. Skipping. Creating "bin/iPhone/ReleaseLLVM/mtouch.stamp" because "AlwaysCreate" was specified. Skipping target "_CopyITunesArtwork" because it has no inputs. Skipping target "_CopyAppExtensionsToBundle" because it has no inputs. Directory "bin/iPhone/ReleaseLLVM/RefitLLVMRepro.iOS.app/../.dSYM" doesn't exist. Skipping. Skipping target "_GenerateFrameworkDebugSymbols" because it has no inputs. The issue title mention Regression. Do you know in which, older version of Xamarin.iOS did used to work with LLVM ? I can duplicate. Both options report failure when compiled with LLVM while they report success when the mono backend is used. This happens with Xamarin.iOS 12.6.0.25, d16-0 which is based on mono 2018-08. I'll look if this also happens on master (using mono 2018-10) once the dogfooding day is over. The same code snippet was working when using Visual Studio for Mac Preview on the "Preview" (not the "Xamarin Preview") channel on Dec 28, 2018. I'm not sure which release between then and now introduced the regression. If I change the return value to show both tuple boolean, e.g. then LLVM returns false, false while non-LLVM returns true, true. It might not be related to an optimization but how the tuple is returned. @brminnick iirc that older (2018) preview was likely using what's in stable right now. I'll double check it and, if it works, tag it as a regression. Thanks! returns a failure to me - so it's not about the code, but how the tuple is returned. Is this only affecting tuples containing bools or does it go deeper than that? @jahmai no, it doesn't affect tuples only. You can read the mono issue here: mono/mono#13610, where there are more test cases, not all involve tuples. @rolfbjarne OK this seems pretty serious then. Probably warrants more than a few lines in the release notes? Doesn't WatchOS Extension require LLVM for Bitcode to work? Yes, watchOS extensions require LLVM. We're trying to get the fix into a service release asap. Closing since the fix has been merged into d16-0 (PR #5838). I need this open for internal tracking. Will be closed when we ship a service release containing the fix. This doesn't appear to be in 16.0.1. Any time scale on when it will be available? @jahmai I can not comment on specific dates. I can confirm that this will be in a VS servicing release in the coming weeks.